OTTAWA—The Power Shift conference for environmental and social activists that took place this weekend had more Blundstone boots, Mason jar mugs and bandanas per square metre than anywhere else in the nation’s capital. Smiles were an accepted form of currency, and the energy of like-minded individuals did as much as the fair-trade coffee to keep spirits high. The conference opened Friday night in Gatineau with speeches and performances, including an address from Gabriel Nadeau-Dubois, former spokesperson for the Coalition large de l’Association pour une solidarité syndicale étudiante. Participants arrived late at night after flying, busing and riding the rails from all over the country to dicuss the future of a sustainable Canada. The name Power Shift stems from the idea of transferring control from rich and powerful polluters to concerned Canadians. Quite literally, the goal is to shift power. Taking place at the University of Ottawa, conference organizers and facilitators took time to acknowledge their presence on unceded Algonquin territory. The rights of First Nations people and the abuses to their land, particularly in rural and northern areas, were issues raised frequently. Saturday morning started with an introductory session called We Are Power Shift. It began with a welcome for everyone—men, women, trans people, rural folk, city folk, people from near and far. Session facilitators Brogan Carruthers and Hilary Thomson both came from Halifax. “A wonderful thing about Power Shift is that we have the chance to learn from each other,” said Thomson. A number of workshops and panel discussions followed, including one on the corporatization of universities. One of the panelists, Adam Awad, national chair of the Canadian Federation of Students, used monopolies on campus food services to illustrate how a corporation can have negative effects on students’ everyday lives. Companies like Chartwells, Concordia’s food service provider, often have exclusive contracts with the universities, allowing them to set the prices and standards for campus food. Awad also talked about contracted English as a second language programs at universities, something that has recently come under scrutiny at Concordia. Facilitator Charity Fraser, a postal worker from Nova Scotia, led a workshop on non-violent direct action and civil disobedience. She explained these can mean different things to different people, and not everyone is comfortable with the same actions. Fraser then posited a series of scenarios to the participants, including “occupy an MP’s office,” “throw a rock through a McDonald’s window,” and “pie a politician,” and people moved to reflect their position. One of the Concordia students in attendance had second thoughts about refraining from taking over a parliamentary office and changed his position, laughing. “If I’m going to throw a rock through McDonald’s, I can occupy an office,” he said. A number of attendants, including a couple of Concordia students, were sporting red squares pinned to their shirts and jackets. Participants left the workshop with planning tools to organize acts of civil disobedience. A half-circle chart called the “spectrum of allies” was demonstrated, showing how to prioritize which interest groups get targeted with a message. Fraser also shared a list of 198 methods of nonviolent action, from walk-outs to marches. Hannah McCormick, a member of Sustainable Concordia, said the conference has helped her decide to focus her energy on organizing direct actions against oil sands development in Alberta. “It’s a great opportunity to meet people all across the country, in your neighbourhood, and develop skills of organizing and knowing how to move forward in a way that’s really effective,” she said. 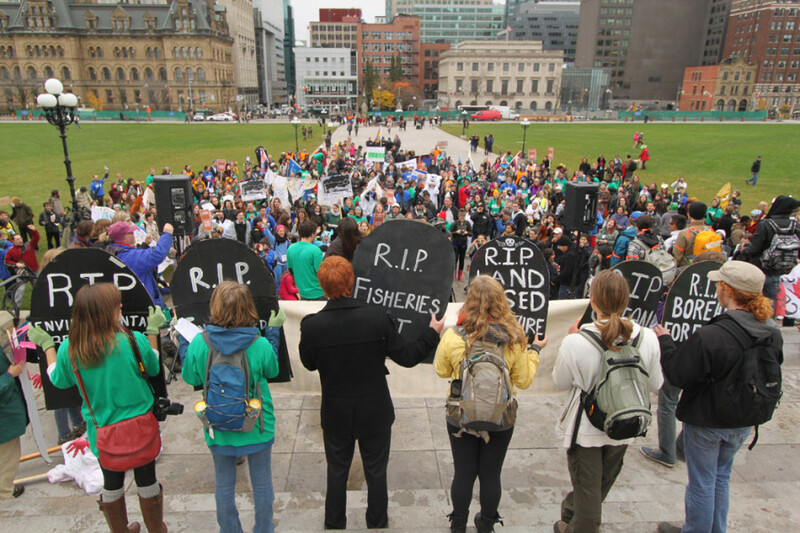 The conference concluded Monday morning with the “Trick or Toxic Treat” march on Parliament Hill, demanding action against climate change and an end to oil company subsidies; participants dressed up as environmental disasters, their least favourite oil executives, and ‘ghosts’ of environmental regulations. Still, it was Saturday night that was the highlight of the conference, featuring five keynote speakers split between two auditoriums, with speakers broadcast live via video feed to the other room. Such a large group of delegates couldn’t fit in one room, but the division allowed everyone to hear all speakers. Cree First Nation activist Crystal Lameman and writer Naomi Klein both received standing ovations for their powerful, heartfelt condemnations of corporate damage to the environment. Lameman shed tears as she told the rapt audience about the damage to her people’s traditional hunting ground from oil sands development. She spoke to the importance of grassroots movements in halting damage to the earth and acknowledged the sacrifice activism requires. “The work that we do, we do selflessly,” she said. This was Klein’s first public speaking engagement since she became a mother in June. She excitedly asked the lecture hall if they wanted to meet her son, Toma. Klein introduced her baby and husband, who roamed the perimeter of the lecture hall bouncing the tired infant in a Baby Björn carrier. The room exploded with cheers and stamping feet when Klein praised the Quebec student protests. “We are all indebted to the incredible Quebec student movement,” she said, noting that student debt, a ravaged environment and a lack of dignified work are all part of a collective problem.